I’ve been keeping a good race semi-streak going for the last few years. I’ve done at least one race per month since March 2009, with only two months off (February 2010 and August 2011). So earlier this year I took a glance at my racing schedule and noticed that, with the exception of crewing Leadville, I had no chip-timed races scheduled for this month. 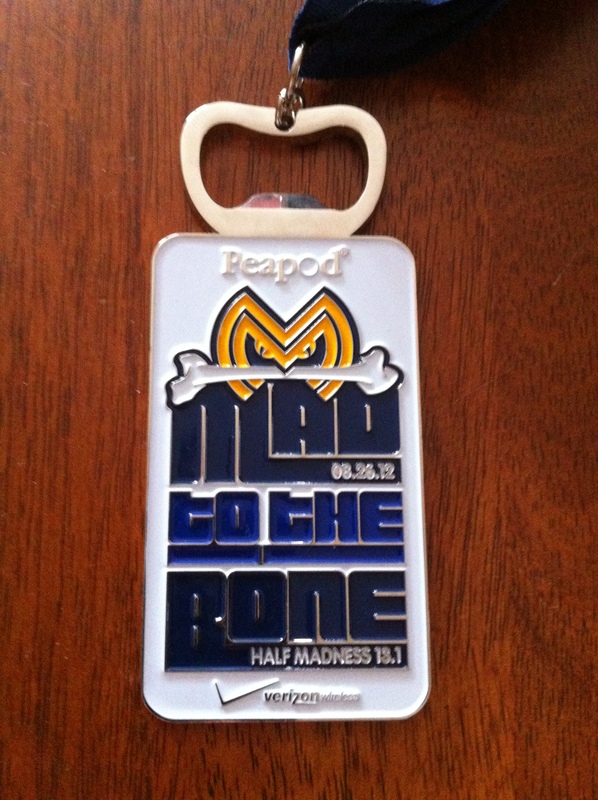 One quick search showed that Jeff “RunFactory” Lung was signed up for a race in the nearby town of Batavia called the HalfMadness Half Marathon. I asked him to sell it to me, and sell it he did. Of course, I told Otter I was running a half just an hour away from Chicago and he succumbed to his crippling FOMO and signed up as well. About a month later, Jeff would pick us up from the South Loop and drive us out to Batavia for the 11th half marathon of the year, simply because it was there. The race started on time and all logistics leading up to it were smooth sailing. Packet pickup was relatively fast and efficient, gear check was easy to find (and given recent news from New York Road Runners, soon to be a luxury), and there was a short line for the ample supply of bathrooms. Jeff and I lined up in the start chute towards the front of the field of about 1,000 runners. He was out to PR and had an aggressive strategy mapped out on a wristband. I had yet to fully recover from the previous weekend’s altitude run and was a bit foggy from two heavy Belgian beers I had consumed the day before. But like any half marathon, I was out to run as fast as I could, in spite of all challenges. To add to everything, it was about 73 degrees at the start, which is much higher than my desired temperature. 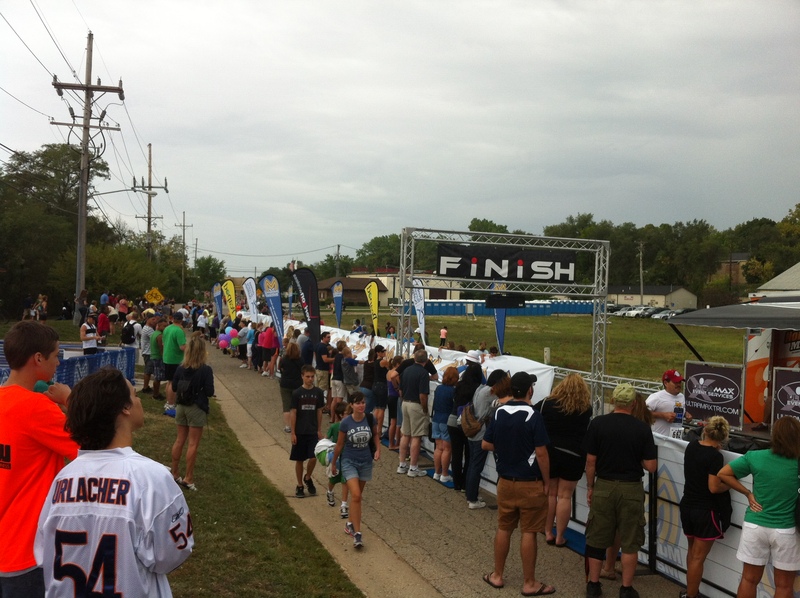 The first four miles of the race cut through quiet neighborhoods with very few spectators making noise. However, in their place were large trees providing lots of shade. Every now and then we’d run in the sun, but it was always short lived. Given that temperatures rarely decline as races continue, I was glad that I could slide through the shadows. The beginning of this race was reminding me a lot of the North Shore Half Marathon in Highland Park, namely with its residential character and threadbare population of non-runners. There were only a few points in the race where we’d see large crowds, but local support doesn’t make or break a race for me. I continued to keep a steady pace around 7:10 and hoped for the best. Jeff started out fast, as I expected him to, but I never lost sight of him. He kept on receding ahead of me, gaining distance, until around mile 5. Right before this point, there was a pretty steep downhill that sliced through the town and then ushered runners onto a path next to the Fox River. I really liked this part of the race for two reasons. First, it was very pretty and that by itself is great. Secondly, it would have been pretty easy to do a typical out-and-back section here, but race organizers decided instead that we’d cross the river and return on the other side. For some reason, I really like races that are designed to be one large circuit and don’t resort to easy out-and-backs to add distance. But my enjoyment of the race began to wane and the race itself was only partly to blame. By mile 5, I knew I had bitten more than I could chew. I felt like I was trying much too hard to keep up the pace. I wasn’t surprised. I haven’t done that many speed workouts in the last three months and here I was pretending it was still May. It didn’t help that the next three miles would be mostly uphill. My only hope was that I had reeled in Jeff. At the sixth mile he had a 20-second lead on me, and I had reduced it to 15 seconds by mile seven. But two miles later, after a combination of a few hills and aid stations that were too far apart, I started to flag. It wasn’t a bonk in the traditional sense, but I could no longer confidently stride at the same pace. I kept looking at my watch, telling myself to not go over 8 minutes. That was the threshold. Kill yourself if you have to, let that queasy feeling in your stomach explode out of your throat, but don’t go over 8 minutes per mile. By this point, Jeff had taken off, unbeknownst that his potential rival had given up the fight. I kept moving forward, creeping dangerously close to the 8-minute barrier. I clocked mile 11 in 7:59 and kept going, the course now entering a thin bike path, surrounded by trees. All of a sudden, I felt great. I couldn’t quite explain it in the moment, but the gasps and grunts of the past three miles were gone. I felt light on my feet, confident. While I wasn’t quite invincible, I felt newly invigorated. At the time I thought, maybe it’s the thin path, creating the optical illusion of speed. That’s somehow feeding my brain the idea that I’m capable of picking it up, which is making me actually faster. Maybe this is that elusive second wind, or that spectral runner’s high that people like to talk about like the ghost of a local legend. But something was happening, because I ran the twelfth mile in 7:39 and the thirteenth in 7:27. 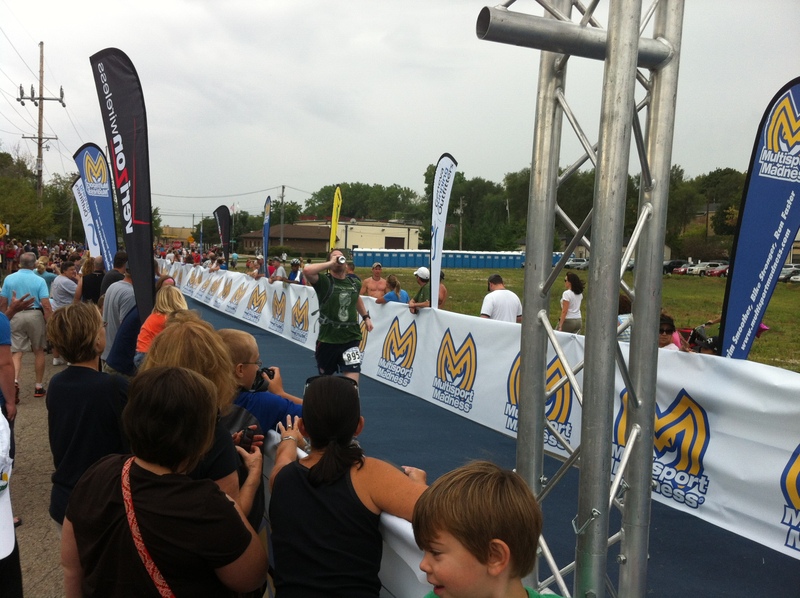 I even had enough to sprint through the finisher’s chute, clocking a 1:36:14. This has never happened, I thought. After every wall, I’ve never been able to get it back together this quickly and sustain it for this long. What is it about today that is giving me this sudden surge? Did I really “dig deep” as they say to do? Did I overcome my pain by pushing past my limits? Had I reached new levels of badassery? “Dude, those last two miles were downhill,” Jeff told me at the finish line. So that explains it. And later when I looked at my Garmin readout, I noticed the definite plunge from miles 10.5 – 12.5. I guess I’ll have to earn my entry into the kingdom of the most excellent by other means. I stayed for the post-race party, which I rarely do, because Jeff said it’s pretty fun. And he did not lie. Not only was there unlimited pizza, but in addition to all the staple post-race goodies, everyone got a free Samuel Adams beer. It’s usually Michelob Ultra who hands out the free beers after races, so it was nice to down a brew with actual flavor while waiting for Otter to finish. I’d love to go into his story and what made this particular race special for him, but I’d be spoiling what promises to be a very entertaining story. So I’ll just wait until he posts it and link to it here. A completely new situation waits for me in the next few months. I’m not referring to my upcoming wedding (which will be awesome), but to the four marathons and zero half marathons I’m running between now and January. The time to be fast has ended, and much like this time last year, I’m switching gears to tackle and conquer endurance. Let’s hope I can get through this without hating myself too much. “Kill yourself if you have to, let that queasy feeling in your stomach explode out of your throat, but don’t go over 8 minutes per mile. ” Well, there’s something I’ll never say. Great race!! 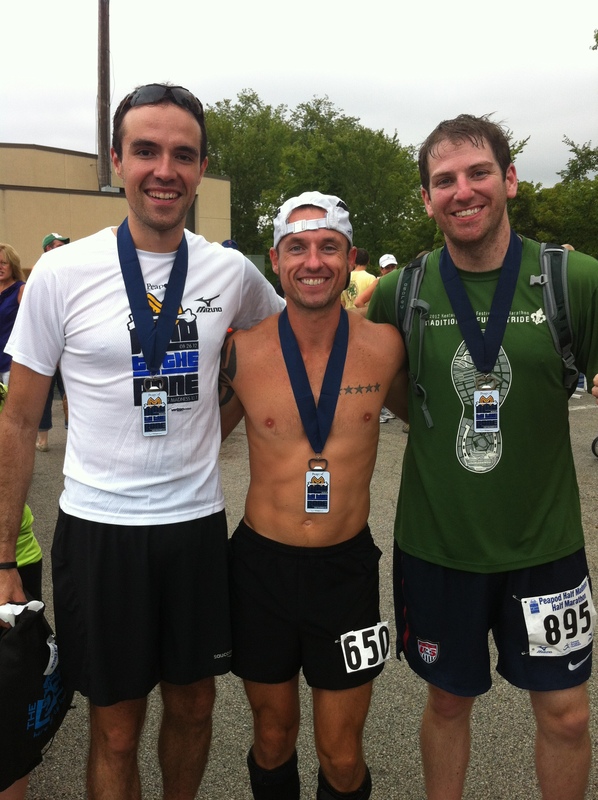 Can’t wait for the marathons this fall- Tulsa here we come! So pumped for Tulsa. But I think they’re revealing the finisher’s medal today. I try to avoid seeing all medals until I cross the finish line, so this will definitely prove challenging. Weird, I love knowing what the finisher’s medal looks like! It gives me something to live for. Another nice recap, Mr. Solera! You’re a beast for running four marathons between now and January. I’m starting to freak out a bit about the ONE I’m running. Much props to you, sir. Great race, Dan! I can’t wait to hear about your upcoming marathons. Remember, train at race pace and get lots of quality recovery time (including recovery runs) and I swear you got a fast marathon (or four) in you! Best of luck! So what you’re saying is, don’t do this guy: http://www.hottesthalf.com/#!/home Anyway, I ran Austin two years ago and loved it – might go back one day for the full. I’m also looking at doing Dallas one of these years.